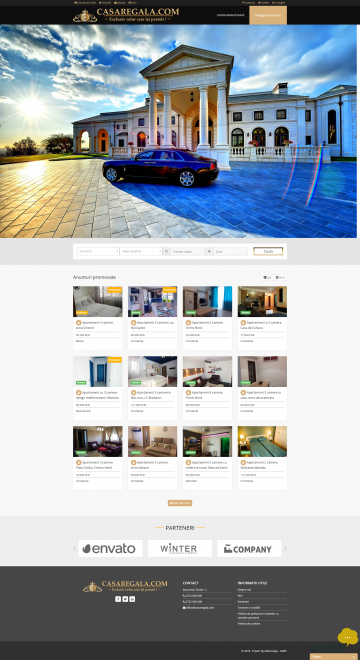 A complex online platform with integrated ads application, dedicated to individuals, companies and real estate agencies. Casa Regala specializes in promoting real estate and offers users structured and easy to access information. The website has a multi-platform presence and covers transactions across the country. The Casa Regala ads portfolio includes real estate offers for sale or rent apartments, single rooms, houses, offices, hotels, boarding houses, commercial and industrial spaces, land. Simple listing and promotion system for real estate ads based on creating an account with username and password. Casa Regala mobile app has a friendly and easy to navigate interface. The user benefits from a fast system to add or view real estate ads. The real estate ad platform and the mobile application Casa Regala are managed from a single dashboard for full access to real estate offers at any time and from anywhere. Easy, fast and secure promotion of all properties through an efficient and organized system. Premium website of real estate ads specialized in the intermediation of transactions for sale and rental of properties. The web platform and mobile app also include a news section to keep up-to-date users with the latest information on the real estate market. The Casa Regala company is a real estate portal that includes the best selection of properties for rental/sale. It was established to find out advantageous real estate solutions to satisfy the requirements of the most demanding customers. The online platform and mobile app Casa Regala facilitate access to the latest and most relevant real estate ads in Romania.